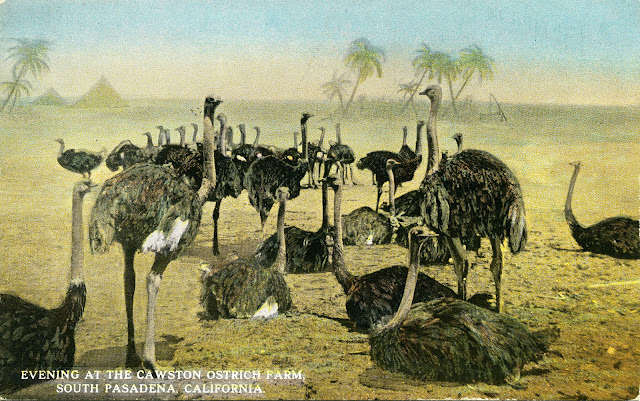 In 1885, Edwin Cawston chartered a ship to bring fifty ostriches from South Africa to Galviston Texas. From Texas, he boarded his birds on a train bound for South Pasadena, California. 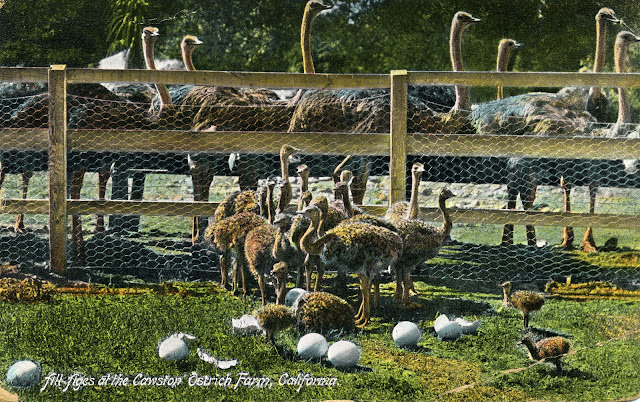 In all, only eighteen of the ostriches survived the trip. But from the remaining flock, Cawston was able to bred and maintain a flock of approximately 100 head for his business — ostrich feather products. 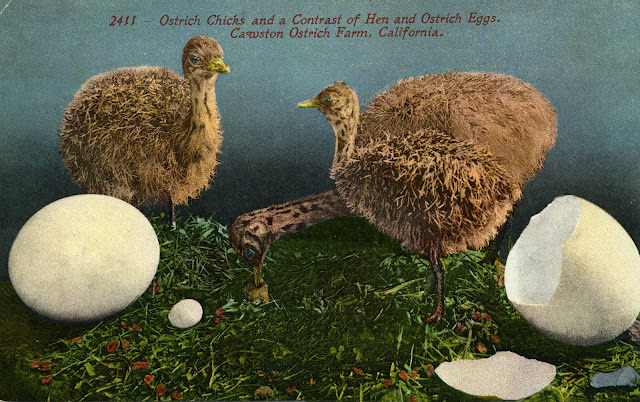 It may seem odd today, but in the late nineteenth century up through the mid twentieth century, ostrich feathers were big business. Cawston's products were shipped worldwide. Cawston wasn't the only game in town or in the country for that matter. If there was a buck to be made from plucking big bird feathers, you can bet that there was going to a lot of competition. Ostrich farms popped up all over the world to capitalize on the feathery commerce. 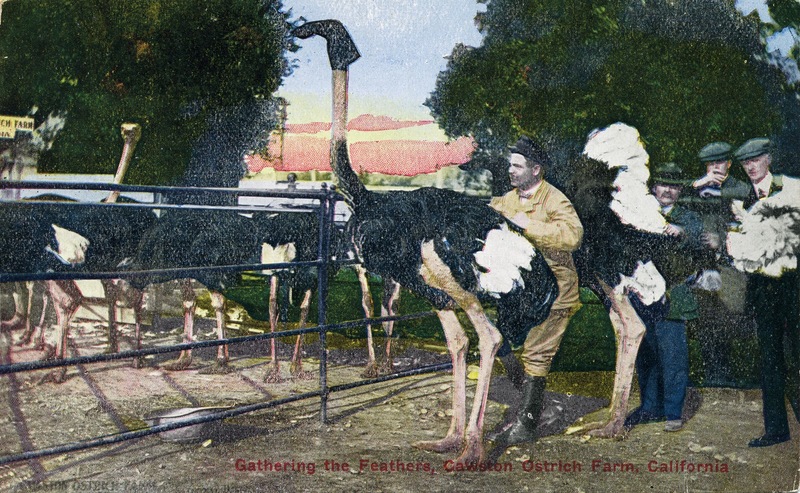 Although the big feather business isn't what it used to be, there are still many ostrich farms across the globe. I've visited a few in my day and can tell you that it takes a certain type of person to raise these birds. Personally, I'd rather stand in a pasture with angry bulls than with ostriches. From what I gather, they're not very smart, can out run anyone you know and I wouldn't advise turning your back on one. 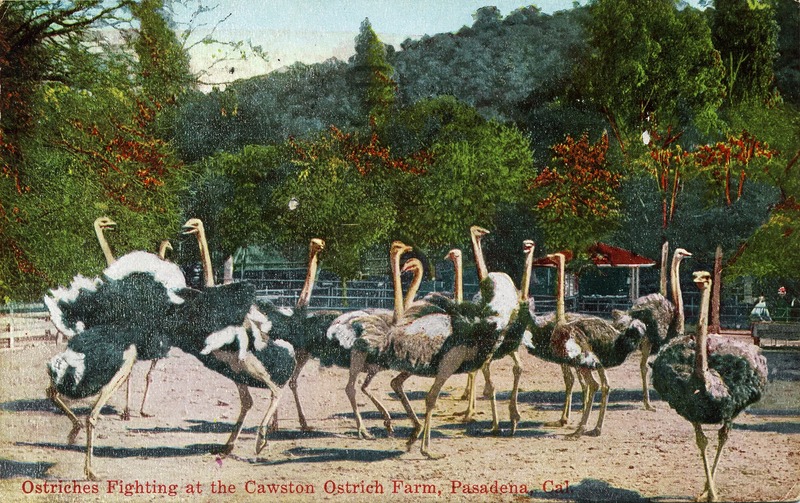 One day, just on the outskirts of Buellton, California, I was standing in front of a flock of ostriches, with a high fence between me and the flock, camera in front of my face, focusing on one of birds when my son gave a shout out that another bird was stretching over the fence looking to peck me in the head. Close call. Oddly enough, this was not my first encounter with an overly curious ostrich. This group of postcards is from the early twentieth century, approximately circa 1910. I really enjoy the first card in this group. I've been to South Pasadena and can say without a doubt that there are no great pyramids in or around the town; nor does the surrounding landscape look like the Sahara Desert. However, I do appreciate the artist taking dramatic license to alter the landscape, achieving a suspended reality for the sake of marketing the farm as an exotic location. I love your blog - and thanks for stopping by at The Daily Postcard. A link would be great. I'm happy to link to your blog. I have categories, including ephemera and old postcards. Does one fit better than the other?